Independence is an important part of your loved one’s happiness. Even while maintaining a regular routine of exercise and a healthy diet, an elderly person's balance and coordination can sometimes falter. As a result, the occasional fall may occur. Unfortunately, it may only take one unexpected fall for an otherwise very independent person to require permanent assistance. Experiencing a fall can not only be dangerous or deadly, but also very expensive. A person experiencing a fall can experience both physical and financial pain. Assisted living, hospital and rehabilitation bills can add up quickly and often devistate a person living on a fixed income. Failing to address the most dangerous areas in the home where falls can occurr can ultimately place a person's independence and financial stability at risk. Falling is one of the biggest risks involved with independent living. According to National Institute on Aging (NIA), one out of three seniors over the age of 65 falls annually. As your loved one ages, the chances of falling only increase, with individuals over 80 years old being 50% likely to fall each year. 43% of the elderly fall and can’t get up (Philips Lifeline). 40% of all falls result in nursing home admission (Philips Lifeline). These falls can lead to injuries like head trauma or fractures, which have negative health consequences. For example, 25% of all seniors who experience hip fractures are likely to pass away between six months to a year later (NIA). Where do most falls happen? One of the most simple daily tasks, taking a shower, becomes more dangerous as we age. In fact, a staggering 80% of senior falling accidents happen in the bathroom (NIA). Therefore, making a safer bathroom for your aging relative is vital to prevent a life-altering accident. Install grab bars in useful places, like next to the toilet and shower. This will help an elderly person safely maneuver around the bathroom. Exchange slippery tiles for safer slip-resistant flooring. Place slip-resistant grip mats inside and outside of the tub. Install a walk-in-tub to reduce the risk of falling when climbing in and out of the tub. How can walk-in-tubs help your loved one? Why put so much at risk when a solution is available that not only mitigates the likelyhood of experiencing a fall, but also adds amazing features not found in traditional bathtubs and showers? Walk-in tubs are one of the most important products that can help the elderly stay safe while living at home. When it comes to bathing, a walk-in-tub greatly reduces the chances of falling. Instead of climbing into the tub, your loved one can simply open a door and step in. 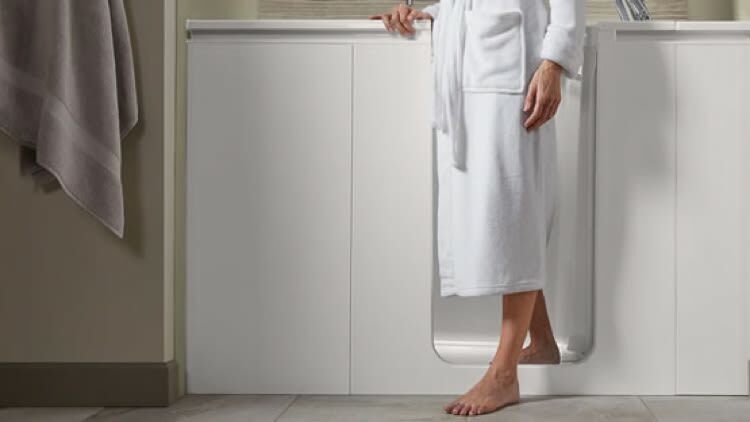 The combination of a low-step ingress/egress, state of the art non-slip materials, and cutting edge safety features found in walk-in bathtub can make all the difference in avoiding falls and maintaining your health and independence. Here’s a little secret though, walk-in bathtubs are also designed set the benchmark for luxury, relaxing comfort, and even hydrotherapy! Aches and pains are eased away through the combination of heat, buoyancy, and massage. The hydrotherapy provided by walk-in bathtubs can even relieve pain by stimulating the release of endorphins, which are the body’s natural painkillers. Walk-in tubs can be configured with massaging jets, soothing bubbles, and even the option for deep soak capacity. The unique design is twice the depth of a traditional bathtub which allows a fully submerged soak not limited by the showerhead flow. As your loved one ages, it takes special innovations like this one to keep him or her happily independent for as long as possible. "Falls Prevention Facts." www.ncoa.org. National Council on Aging, n.d. Web. 21 July 2017. "NIH...Turning Discovery Into Health®." National Institute on Aging. National Institutes of Health, 27 Apr. 2017. Web. 21 July 2017.